One on One Conversation With Eric Grauffel – One Of The Best Shooters In The World | Firearms, Edged Weapons, Fighting Fitness and More! Eric and in 2005 (?) during a class I took from him and his father. The class was eye opening and I certainly credit him with some of the information I currently pass on in my classes. This blog is a series of questions I asked Eric via email, and his answers are largely unedited except for some small spelling errors. My comments are labeled and underlined. Mike: From what you know about your competitors, is there anything you do different technique wise? For example, if you feel you grip the gun differently, please describe? Eric: I am one of the few guys having a support finger in front of the trigger guard. Why? Because for me it is very confortable. I have some other techniques especially on the move, and moving in and out of positions. Mikes comment: “Other techniques especially on the move..” A bit vague here…maybe we can get Eric to expand on this in a future blog or the comments! Mike: In your opinion, do the technique differences between you and your competitors make the difference between winning and losing? Eric: I can’t be affirmative at 100% on this one, but my feelings say it helps. Mike: How much do you dry fire your gun? Eric: Only when I can’t go to the range. 10-15 minutes and that’s it. Mikes comment: Eric is unique in that he has the ability due to his sponsorships (Armscor) to shoot a lot. During a recent video interview in Las Vegas Eric commented about the amount of ammunition he shoots during the year, and I can attest it is even a higher amount than I had imagined. He has the resources to work HARD at shooting, and does so. For those of you that have less resources, more dry-fire might be your solution. The key is to stay connected during the training, and some have a hard time accomplishing much beyond 10-15 minutes. Make sure it is quality! Mike: Did that amount differ from when you built your initial skill? Eric: Nope, the same amount when I was still at school longtime ago. Mike: What routine do you use, and why if you use a specific one (dry fire) have you selected it? Mike: Do you use PAR time on a timer to push your skill level? Eric: No never! I don’t like dreamed goals, and I am afraid I won’t be able to reach my expectations, or other guys results that I can see on the internet. Mike’s comment: This is a unique answer. I use a PAR timer in dry fire to keep myself from getting board, and to keep track of my skill speed. That said, I believe strongly that the use of PAR time might be more valuable in the beginning of your development than at the end. Pay particular attention to what Eric says about comparing himself to people on the Internet, I think that is KEY information!! Mike: How much do you live fire practice? Eric: 5 times a week. sometimes 6. Mike’s comment: When team Armscor was queried how much they shoot per year, all of the team members said between 20-50 K per year of live fire. I will let Eric tell you his total ammunition usage per year, but can say he shoots way more than the rest of the team by a huge percentage! Work harder and more….acquire more skill! Mike: Does the current amount of live fire differ from the amount when you started? Mike: Please describe an average practice session, including your goals. What do you practice? Mike: Do you rotate through different practice focuses (such as movement in one session, weak hand in another)? Eric: Usually I have almost all per practice sessions. Just for swingers and shooting on the move, I usually set a day just based on that. 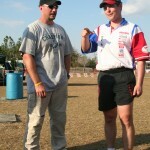 Mike: How many live fire drills do you do per practice session? Mike: What is the single most important thing you wish to accomplish in live fire practice? Mike: What percentage of match shooting compared to practice shooting do you do? Mike: What percentage do you recommend for someone wishing to be “the best”? Eric: I am not sure. if you soot too many matches, you don’t train. If you don’t train, you don’t get better. 2 days match is a 4 days off including travel days. So a good selection of competitions are to me better than shooting a match every single weekend. Mike: Are major matches more important than club matches (I assume yes) to you? Eric: NO! Not at all! I give the same importance to a small club match of 6 stages than a world shoot. Mike: What single skill separates you the most from the rest of your competitors? Eric: I should ask you the questions..
Mike: You are multiple-time world champion. You know you are nearly unbeatable. That must mean you have huge amounts of confidence. BUT, you were not always at your level. How did you develop that level of mental confidence? Eric: I am beatable, and I am not confident like a lot of people think. From the very beginning, I have been prepared to come second. I always start the match remembering me that it can be the last one. Then I try to do the best for me and the people who support me for years. If you are confident in any sport, you usually loose because you don’t see the outsider coming. Mike’s comment: VERY interesting answer. Learn from it. Mike: What tools have you used to develop your mental game along the way? Eric: Training with my dad. Then I developed a strategy work really early between 1997 till 1999 when I came in the US to learn with the big guys. It is based on a work I did with my Judo teacher. I guess the plan still works for now. But for how long?? Mike: Do you think your mental game is what separates you from the crowd? Eric: Again, you to tell me…..
Mike: How do you decided to shoot a particular stage? For example, do you deeply analyze and base off the numbers (hit factor)? Eric: Do you like Math? Cause I do! Mike’s comment: I can tell you that Eric uses his love of math to analyze and help him strategize the stage. This skill is something that can be learned and used at the higher levels of the sport. If you shoot USPSA/IPSC consider really learning how the scoring and hit factor works, and how to use it to analyze what the stage focus should be. Mike: Do you follow the plan you see other shooters take, or do you mostly focus on your own skills? Eric: Both, cause I am following my plan, based on that I make the choice of what needs to be done. Mike: It is often said that you shoot matches at 90%, and wait for others to make mistakes. Would you say this is true? Eric: Aha, yes and no. I don’t know if I shoot 90%, hard to tell. But I know what kind of stages fits my skills. If this is kind of a plan, then I know other people who were and still are doing this plan, and thanks to them because I learned from them in my early learning years. Mike’s comment: If you speak to almost anyone on the Pro circuit, they will tell you that they rarely see Eric “pushing.” He has the skill and knowledge to shoot to his strengths and stay out of his “red line” area of speed/skill which theoretically reduces his chances for mistakes. At the top of the game, less mistakes means the win. Mike: What other factors help you perform so well under the pressure of a major match? Eric: A main factor is that I can handle the pressure. You know that every top guy has sponsors. By the logic, every one want to do well, for themselves, but also for the companies supporting them. There is already pressure here. Then you have family pressure. Then the outsider has the pressure that he wants to perform. So every one has different types of pressure, and then you have to manage it. Mike: You have worked for years with a coach (your father). How has this contributed to your mastery of the game? Eric: A lot, cause he always had great training ideas. Sometimes funny, sometimes undoable, but I had to do it. So it helps you getting prepared to any unexpected situations. Mike: Did having a coach such as him make the difference in you becoming one of the greatest practical shooter of all times? Eric: My personal answer is YES, but there is no chance to do a retry without him, to know the true final answer. Mike: Have you done vision, fitness, or other training other than shooting to directly increase your shooting skill during your career? If so, what kind of training? Eric: I used to do. I really miss it now. I used to do semi marathon, until I had a left knee problem. I just do general fitness, no specific work. Mike: Do you work on speed, agility (running) drills regularly? Eric: Pretty much at every training session. Mike: Do you work on grip strength? Eric: Not really. Windsurfing helps a lot for hand strength. Mike: What other factors that I might have missed make you different than the rest. Everyone is chasing Eric. What stands out to you as the single biggest factors involved in this? DO YOU SIMPLY WORK HARDER and SHOOT MORE??? Eric: I don’t know. I do work for sure, harder I don’t know how much work other top guys. I do shoot, that’s for sure, but most important for me, I am having fun every single shot. I hope you enjoyed some insight into the mind of one of the greatest shooters that ever lived! I know I did. Please comment if you like this post and I will add more like it! 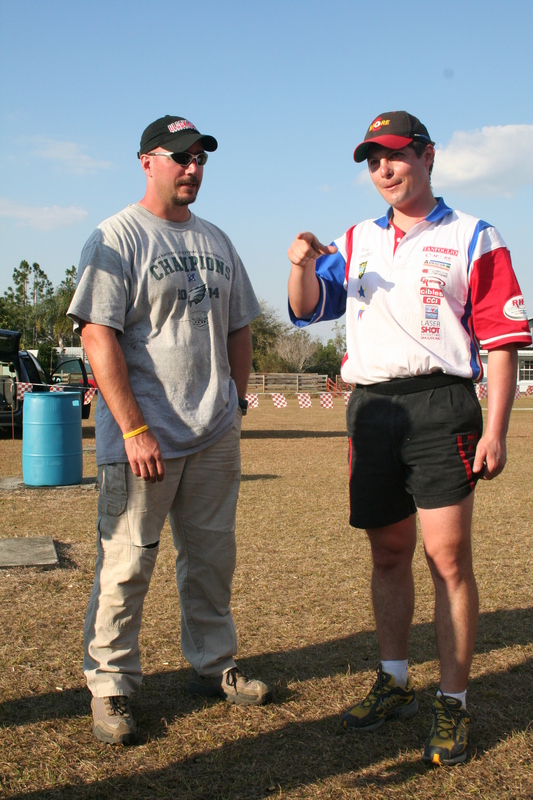 Tagged eric grauffel, handgun shooting, ipsc, mike seeklander, practical shooting, uspsa. Bookmark the permalink. This is awesome. I am a big fan of Eric, and it’s tough to get any coverage of him in the US. Some of his techniques are amazing, and it would really be nice to hear more of his ideas about shooting. Thanks Mike Eric is a Gentleman and Champion. I had the pleasure of being squaded with Eric and his Dad at his very first US Nationals in 1997. He was 15years old and had just won the European Open. I think he came in third at his first US Nationals. We all knew by the end of the first day he was one of the best. He sure is. One of the very best that will ever bless the sport, I believe.